I am seeing a whole lot of green and couldn’t be happier about it. 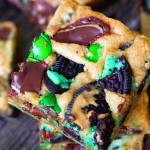 Over the weekend, I finally managed to whip up a recipe fit for St. Patrick’s Day and since this was my first “green” recipe this year, I couldn’t help but stuff as many things as could possibly fit into these blondies. Chocolate and Mint is one of my very favorite flavor combos. So I may or may not have gone a bit overboard at my weekly grocery trip last week. I basically filled the cart with my go-to mint candies – Dark Chocolate Covered Mint M&M’s, Andes, and last but certainly not least Mint Oreos. The lady at the checkout gave me a huge smile as she scanned all of my green treasures, which led me to believe that buying that much candy during one trip is perfectly acceptable and that I might not be the only one going a little overboard with all things mint this time of year :). 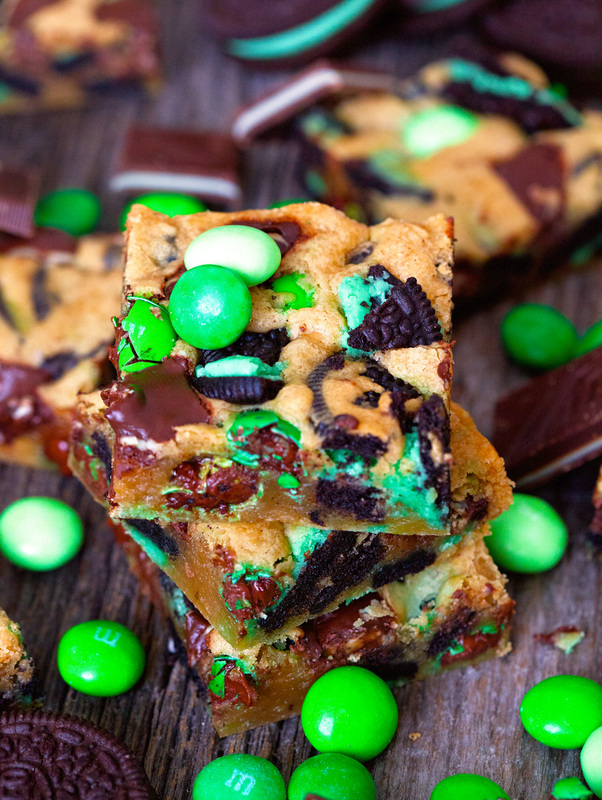 I doubt that stuffing anything with all of that fabulous candy could yield something less than delicious, but these blondies are the perfect vehicle to let chocolate and mint shine. This recipe is right up my alley since I love easy peasy recipes. And this one is as simple as they come. I have had my fair share of blondies and I can honestly tell you that these come out just right every single time. They are dense, buttery and so scrumptious. And needless to say, you could totally swap out any of the add-ins I chose and use your favorites instead. Chocolate chips, nuts, and the list goes on and on. You really can’t go wrong. Oh, one thing I can’t forget to tell you about is the wonderful smell your house will be filled with. As these blondies were baking away in my oven, I was in the process of cleaning our house. As the timer came closer and closer to being done, I definitely did not have to get my arm twisted to take a short break. I just had to have one freshly out of the oven! Here’s to a delicious week ahead. Happy Monday! 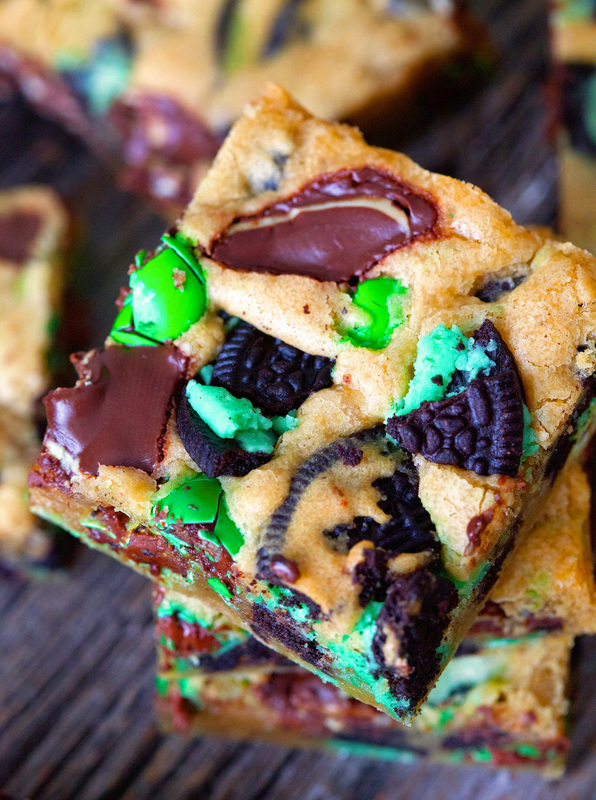 A tried and true recipe to make a perfectly baked pan of Blondies! 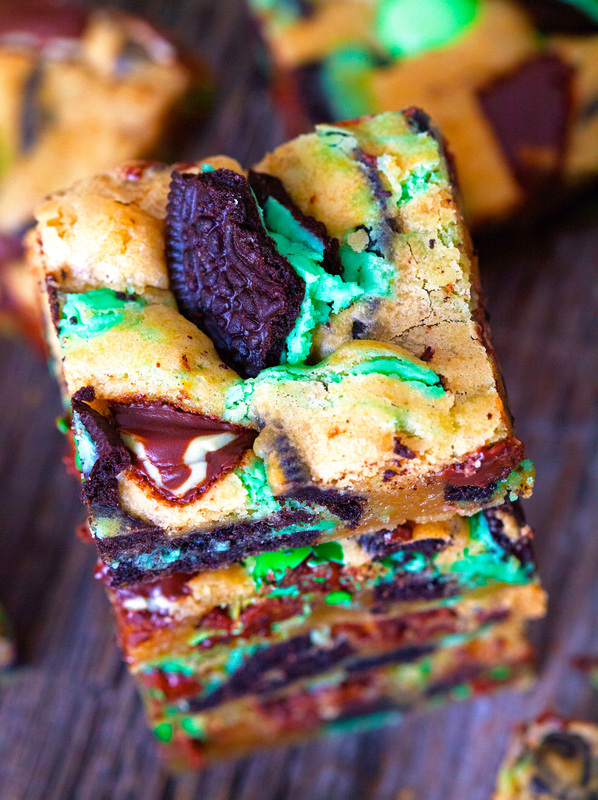 If you love mint and chocolate, you will swoon over this scrumptious version! 1. In a medium bowl, using a rubber spatula combine butter and brown sugar. Add egg and vanilla and mix until incorporated. Stir in salt and flour until fully incorporated and no lumps remain. 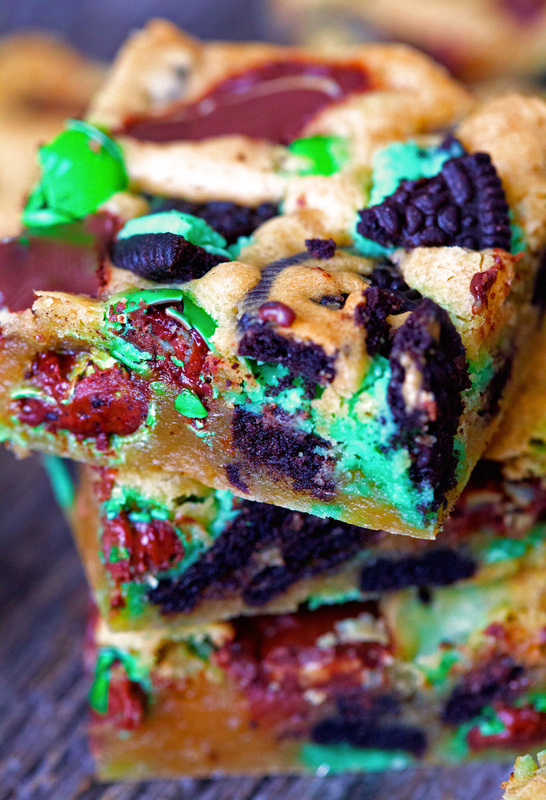 Mix in Oreos, Andes, and M&M's. 2. Pour batter into prepared baking pan and top with additional candy, if desired. Place in the oven and bake for 20-25 minutes or until a toothpick inserted in the middle comes out clean. Let cool and cut into squares. Blondies will keep up to 1 week stored in an airtight container in your fridge or for up to 3 months in the freezer. These blondies are seriously fantastic. I love the layering of flavors here with the chocolate and mint. Patty’s Day Perfection! 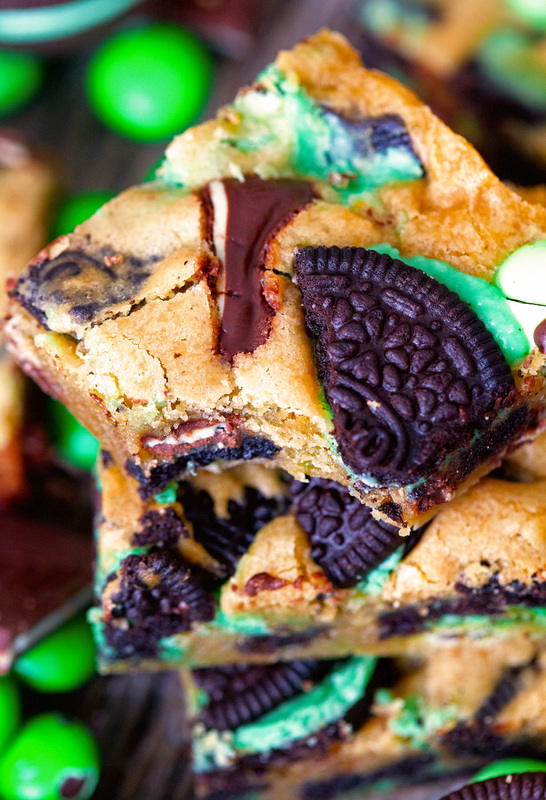 If you make only one thing to celebrate Saint Patty’s, you should definitely give these a try. We practically inhaled them. Thanks, Jocelyn! You really can’t go wrong with these!! Thank you, Ashley! You are too kind! Thank you so very much for sharing this insanely delicious creation, Trish! I just couldn’t help it! Go big or go home, right?! Thanks, dear! Oh my WORD, Kathi!!! These look fantastic!!! I seriously big fluffy heart blondies and these look not only easy but amazing! Thanks for the recipe, PINNED!!! You are so sweet! Thank you so much for the love and for pinning! They are :). Thanks, Nicole! Love the bright colors! Looks like a winner. 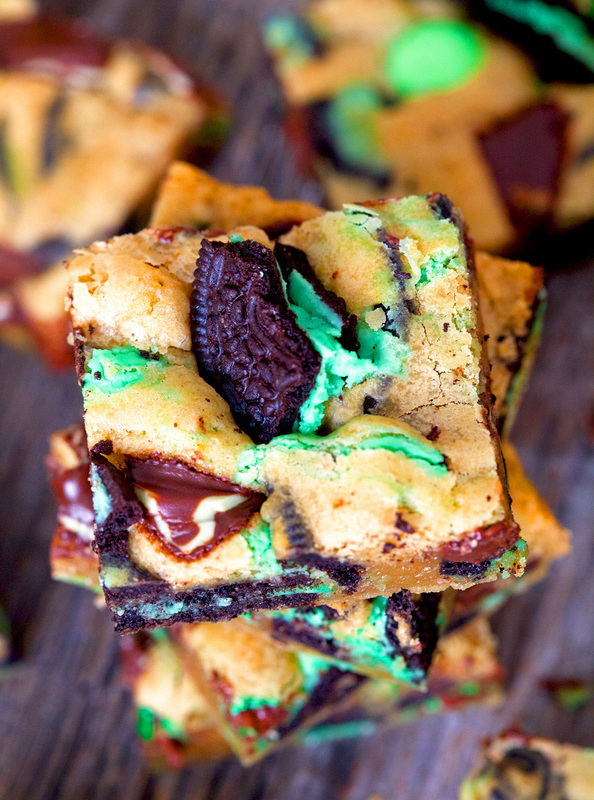 There’s nothing like a whole lot of green and chocolaty goodness. Thank you so much, Carrian!